The 2014 Akron Marathon, Half Marathon, and Marathon Relay are next month, and there is still time to register. So we thought that Casual Runners might want to know a little bit more about our experience at the 2013 edition of this event. If you read my previous posts on Casual Runner, you know two things about my history with the Akron Marathon race weekend. The first is that I entered the 2012 marathon team relay as my first race. The second is that it did not go well (see my blog on the worst race ever here (http://casual-runner.com/2014-07-28-worst-race-ever/). After that experience, there was no way I was not going to come back in 2013 to get a little bit of redemption. The event marker in downtown Akron, every race really could use one fo theseI spent nearly 7 years working in an office located in between the starting and finish lines for the Akron marathon and half marathon, and during much of that time I was not living a healthy lifestyle. 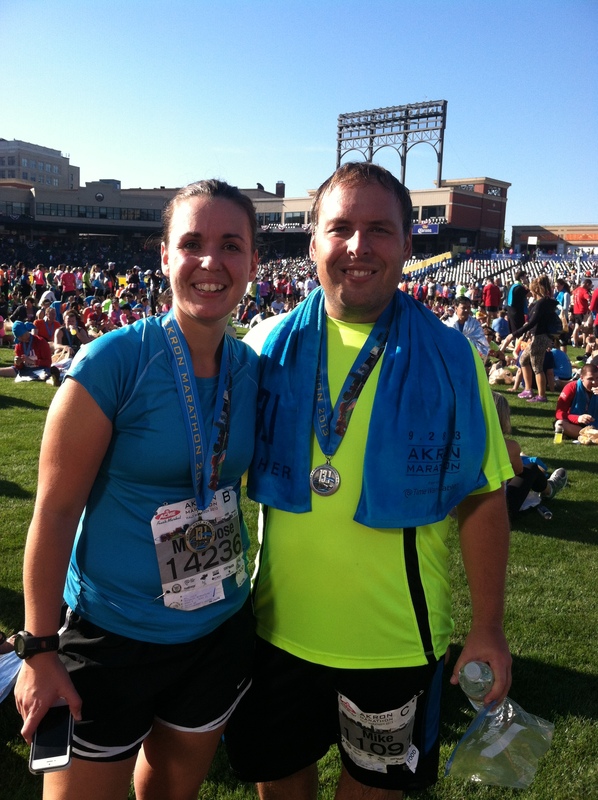 When I decided to get up off of the couch and begin my adventure as a Casual Runner, there was no way that I was not going to run the Akron half marathon. This would also be a social affair for me as my brother and my friends Melissa and Ryan were also running the half marathon. Getting there/the lead-up to the race. On the Monday of Race Week in Akron, I was driving into work as usual, and I happened to find myself sitting at a stoplight behind the official race car of the Akron marathon. Somehow I knew that this was a good sign of things to come. Akron is a rare Saturday event, which I actually really like. This means that the expo is held on a Friday at the John S. Knight Center in downtown Akron, which was walking distance from my office, talk about liking timing and geography for me. Since I was used to the drive into Akron, I decided to stay at home the night before the race. The city can easily handle the influx of cars heading in for both the expo and the race itself, and I did not experience or hear of any travel delays. Additionally, parking was ample for both (and free on race day). Akron does a great job with branding their event. I assume that it is for logistical reasons, but most races no longer use the blue line to denote the marathon course. Bucking this trend, Akron embraces the blue line throughout all aspects of the event, and it is a branding decision that I both like and appreciate it. From the moment you arrive at the expo, you are greeted with an actual blue line to follow throughout the expo center. Ok, I am not going to lie, this is pretty cool. The ever-present blue line at the expo location not only resolves any questions as to where you should go to proceed through the crowd, but it adds a sense of purpose and organization to the entire experience. This is not the biggest expo, but with the assistance of the blue line, I feel as though it is easy to ensure that you see every booth that you want to, which is not common amongst the various expos I have attended. In addition to the ample offerings of running gear, apparel, and nutrition, there were significant representations of sports medicine professionals and representatives of other races. I took my time visiting these various booths and had some great conversations along the way. Perhaps I spent so much time at the expo because I was in no particular hurry to get back to the office, but regardless, overall, it was a very enjoyable expo experience. Packet pickup was the first thing you saw and was quick and painless. I was able to pick up the packets for my brother and my friend who were unable to get away from work (remember, as I said, the expo is on a Friday as the race is a rare Saturday morning event). In order to exit the expo, the blue line takes you past all of the various vendors (at which I spent way too much time, but its ok, we were having a good time), and then the last stop in the main hall is the shirt pickup. After you leave the main hall, you pick up your gear check bag and then are on your way. 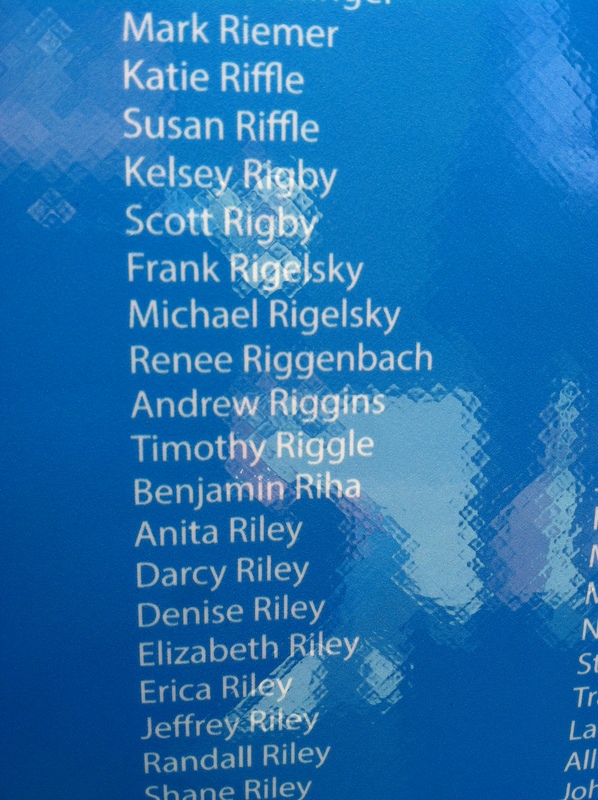 The side of the event car with all of the runners’ names displayed…why does my brother keep getting top billing over me? Oh, and did I mention that outside of the expo center they had the official marathon car that I saw earlier in the week? What makes this special is that the event organizers placed the names of everyone entered in the event? 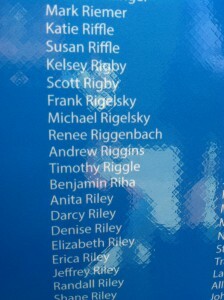 Of course my brother still managed to get top billing over me. Oh well…one day! Still, it was a very cool addition to the expo. Not only are the race organizers conscious of branding (the blue line is everywhere), they bring their game when it comes to swag. Brooks is an official sponsor of the event and all of the official race shirts incorporated the blue line. For the half marathon, they offered both a men’s and a women’s long sleeved tech shirt (did I mention they had the blue line in the logos?). Both shirts were nice. They had separate shirts for the marathon relay participants, and, per tradition, all full marathon participants receive light running jackets. There was no other swag given for this race…or so we thought…stay tuned. The forecast called for a cooler morning, with the warmup not happening until later in the afternoon, so I opted to go for a short sleeve Avia tech shirt, compression shorts, running shorts, moisture wicking socks, and my Nike wrist bands and head band. For my feet I wore New Balance Minimus running shoes. My ankle had recovered sufficiently since the Presque Isle Half Marathon 2 weeks earlier (more on that in a later post, but suffice to say it was not a fun experience) that I felt comfortable not wearing the compression sleeve I wore in my previous race. I also had my new IPhone 5S loaded with a specially-prepared playlist for the event, but this time I opted for a simple Ziploc bag to keep in dry in my pocket instead of an armband. For the IPhone I planned on using a pair of Yurbuds Ironman Series headphones and would be tracking my performance using the MapMyFitness app for Iphone. Both the start and finish to the race are in downtown Akron (just a few blocks from one another), which means there is ample parking a short walk from both. At the time I was working 2 blocks from the starting line, so my friends and I arranged to meet there to do our pre-race stretches and warm-ups, and it also allowed us to leave our belongings there rather than using the event’s bag check. The best bonus to using my office? No port-a-potties. Don’t get me wrong, I am not above using port-a-potties, and they are a necessary component to running races, but having nice bathrooms with no lines is a true luxury before the race. The streets of Akron were packed that morning, which was nice to see. Unexpected Magic.As we left the building to head to the starting line, I ran into Julie, an old friend who I had not seen in years. When I say old friend, I mean it. Julie and I have known each other since before we started kindergarten, and then remained classmates through high school graduation. Her husband was running that morning and she brought her son out to cheer him on. I was fortunate to see her amongst the thousands of runners and spectators who were downtown, and it was the perfect surprise to get my race day started. You never know who or what Casual Running will lead you to run into. Akron previously utilized a mass start wherein runners self-selected their starting positions based on pacing signs posted along the starting area. For the 2013 race, event organizers announced that they would be using timed corrals for the first time. While I am normally a fan of starting corrals, they only had 3 corrals, which, frankly, were essentially no different than the mass start utilized the year before. As a general rule of thumb, I am of the opinion that more timed corrals makes for a better start experience. They had someone sing the national anthem and fireworks for the start of the race, but since my start corral was around the corner and blocked by a building, I really did not get to see or hear either. The Akron community takes a great deal of pride in this event, and it shows in the number of spectators who come out to support the runners. I would not say that the crowds were huge, but they were certainly more than one might expect in a town the size of Akron. The advantage of the downtown course (the half marathon passes through downtown 4 times), allows spectators to move within the course and see runners several times without having to travel too far. Race Icon. The Course starts out heading north from downtown across the Y bridge (a large bridge over the Valley) just as the sun is starting to rise in the east. It is a beautiful sight to the east, and to the west is the southbound span of the bridge that allows you to catch a glimpse of the elite runners who are already on their way back into downtown. Race organizers do a nice job of spreading entertainment throughout the course. I am a big fan of high school bands and drum lines at races, and this event had plenty of both. There is always that one trumpet player who is jumping up and down enthusiastically as though his football team just won the state championship…how can you not get excited when you see something like that? Have I mentioned just how much I loved having a blue line to follow throughout the entire race course? I found myself, even without doing so intentionally, running right on top of it throughout most of the course. Ok, I may have been geeking out a bit, but it was fun. I have always said that I regret not having gone to see races when I was a kid (there were none anywhere near where I lived at the time), as I every time I see a child in the crowd I hope that they are inspired to live active lifestyles and, maybe even become Casual Runners one day. Unexpected Magic. One moment struck me as particularly inspiring. As we were traversing the Firestone Park neighborhood (near where my sister-in-law grew up), I saw a young boy, no older than 12 or 13, running from his house towards the course that was passing by his front yard, his arms filled with all of the bottled water he could manage. The immense pride and excitement on his face as he was trying to do his part to support the runners was inspiring. In reality, he probably “only” was able to help out 5 or 6 runners as bottled water is not the most efficient way to distribute water, but that did not matter, because I am confident that, on that day, we runners helped to inspire him. The half marathon, which covers roughly the first half of the marathon course, is not that hilly (though the second half of the marathon is…or so I am told as I have never run it). There are some inclines, but they are not that bad. The course takes you through neighborhoods, past some business districts, and eventually onto the campus of the University of Akron, where the students were up early (or perhaps still out from the night before?) to cheer us on. This was a nice part of the course that I did not expect as the event took us off of the streets and onto campus sidewalks and pathways. I think it ended up being my favorite part of the course. In order to cover the necessary mileage, the course designer takes runners back into downtown, across the starting line, and through a repeat of the first 2 miles of the race, which includes the aforementioned Y bridge. My only issue with this is that at this point in the race (miles 11-12), I was running low on adrenaline and the “climb” at the end of the 4th time crossing the bridge seemed much more grueling than it had a few hours earlier. You then have to climb a short hill into downtown, and at this point, I was pretty much spent. I fed off of the supporters scattered throughout downtown (by this time, many had moved onto the stadium finish). But somehow I managed to keep pressing onward. The downtown component nearing the finish is a very nice part of the course. The turns amongst the buildings are enjoyable and there were some spectators gathered around the musical entertainment. When you turn left onto Main Street, the crowds picked up again and there is a great atmosphere as runners who already finished their races were joining in to cheer on their fellow runners (slower runners ALWAYS appreciate when faster runners cheer them on). Course officials funnel you into a chute that takes a sharp right behind right field of the Akron Aeros’ (now the Rubber Ducks) stadium and behind the scoreboard. The slight downhill gives you a moment to catch your breath before the big finish. Race Icon. 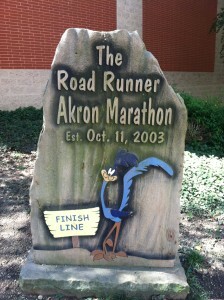 The best part of the Akron Half Marathon course is, without a doubt, the stadium finish. You emerge from a gap in the centerfield wall and sprint towards home plate. Thousands of spectators filled the stadium seats cheering you on, it was pretty spectacular. The only slight knock is that, since you are running away from center field, you cannot see yourself running on the jumbotron. Oh well, I guess you cannot have everything. A fist pump or two was definitely in order as I crossed the finish line with the adrenaline kicking into high gear. Best finisher’s gift so far? The medals are much nicer than one might expect from an event held in a “smaller” city such as Akron. Race organizers made some smart decisions in investing in, and thus ensuring that the medal would be a valued keepsake. They also used the city’s skyline and icons as the design for a custom made ribbon, which was also of good quality. Overall, the SMO receives solid marks in my book. Remember how I left you hanging on the swag review? 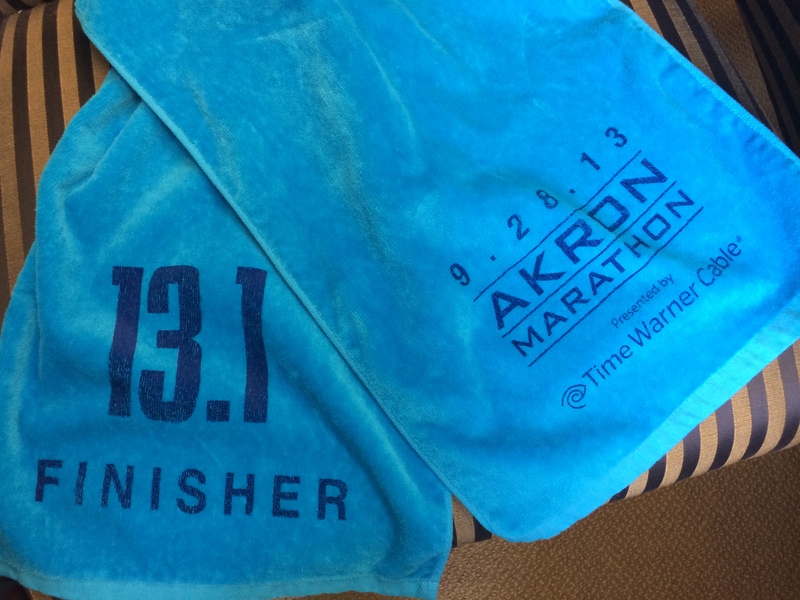 Well, to my surprise, in addition to the medal, race organizers presented us with a finisher’s present: a very nice towel. What color was it? Well, blue of course! This was a great gift. Not only was it useful to help dry ourselves off after the race, but the towel itself was a very nice quality and made for a nice keepsake. Very well done, indeed, Akron. While I understand that race budgets can only be stretched so far, it is surprising that more race organizers do not include these small touches that runners very much appreciate. My friend, Melissa, and I showing off our SMO’s and celebrating another successful half marathon experience. Race organizers do a good job of keeping the atmosphere in the stadium festive as they have a finishers’ village set up in left field. The finish chute steers you towards plenty of water, sport drinks, food, and beer. Oh yes, beer never tasted so good as when you drink it, sprawled out in the well-manicured grass of a minor league baseball stadium after having just run 13.1 miles. It was a great way to decompress and relax with friends after the race. The only knock on this is that non-runners cannot join you in the village, so you have to make a choice if you have non-runners with you where you will spend your time. Additionally, the race organizers had an excellent selection (and with ample quantities) of food and drinks for the runners. However, as is my standard practice after a race, I chugged about 100 ounces of water (in addition to the aforementioned very tasty beer), but really do not have any appetite whatsoever for carbs. So I went off in search of other kinds of food for lunch, because I was getting hungry. Fortunately, my car was only a short walk from the finish line, so I was in my car and on my way in no time. In addition to finally getting my redemption from the previous year, I quite enjoyed this event, and I continue to be impressed by how a community the size of Akron can put on such a quality event. I am already entered in the 2014 half marathon event at the end of September, and look forward to another fun experience. Also, it bears repeating that Akron is one of the rare races that take place on a Saturday morning instead of a Sunday, which I really like. I wish there were more Saturday events as it leaves you the rest of the weekend to enjoy yourself and celebrate finishing the race, but of course only in a responsible, adult manner…Oh, and did I mention that they have a blue line? Because they do!